Those masks are really cool. I like the old hag Witch the best. 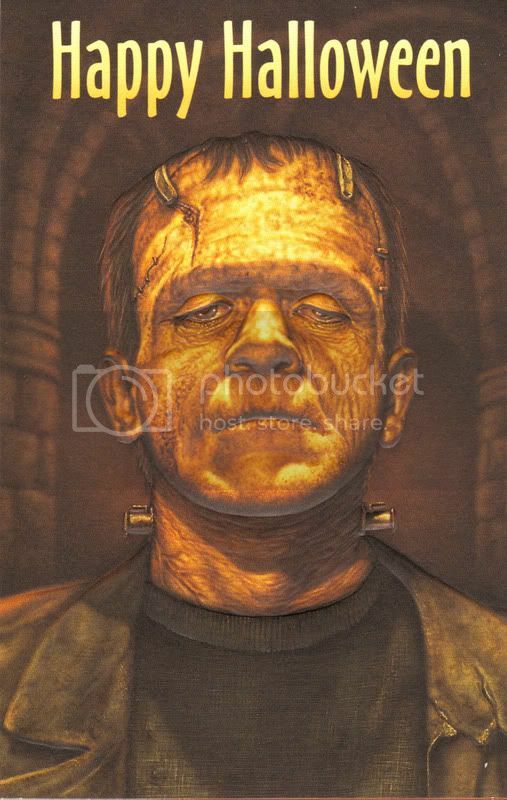 A few years ago I found a stack of these Halloween cards in a Mexican dollar store. It wasn't anywhere near Halloween and there weren't any other Halloween cards!?!? Picked these up at a small thrift shop yesterday for the price of a loose tauntaun, an extra robot and $18. Not sure what they generally go for but the two toys I traded, I would have given away for free so it seemed worth it. Sure, it's '76 Kong, but I kind of like the decanter for some reason. I don't know anything about the other figure, but I assume it's just a bootleg. I love the Jim Beam decanter, I've got one with the box which isn't very special. Damn Dave I do believe you got the large size Imperial Kong there. Does it say Imperial on it anywhere? I think you're going to have to just send that on along to me. By the way I am working on a box of stuff for you. Trying to group together some monster stuff I have extras of. Nope, all it says is "Made in China". No other markings of any kind. Dave , that big Kong is Imperial. It's the big Kong to Imperials Big Godzilla. Had a hang tag like the smaller kong. The smaller Kong, just like the Godzilla, was available both loose with a tag around the neck and carded. The larger versions had tags around their necks. The weird thing is that as much as I saw the other versions I never saw this large Kong back in the day. I still don't have it either. Weird, when these originally came out I was really into Kong. Suncoast Pictures used to sell them, but like you said, never the Big Kong. I never even knew he existed until a few years ago when I saw a pic of him in a price guide. I did find one last year on Ebay. 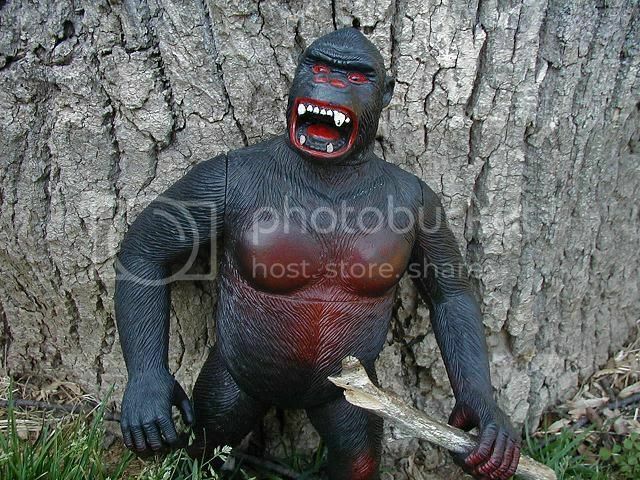 Was in a lot with something else so I let the other bidder win, and they just sent me Kong! Great scores Dave, looks like someone gave Kong a green manicure. Sorry I haven't posted in a while. It is convention season and Swap Meet season. 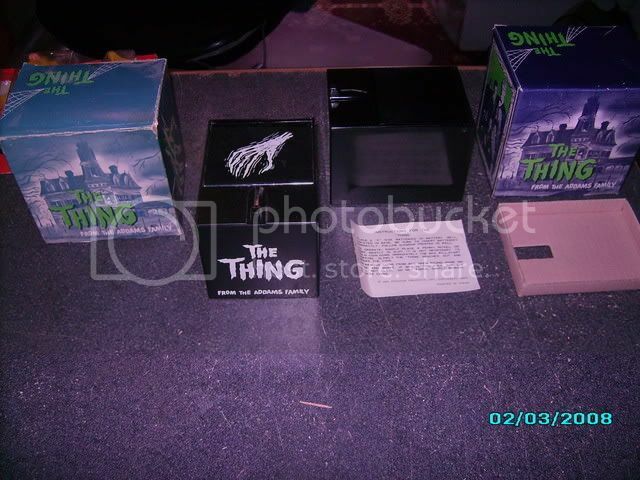 Here are a few finds of mine at The Glendale Show. Danny made it too. We had a very nice visit, but as always to short. 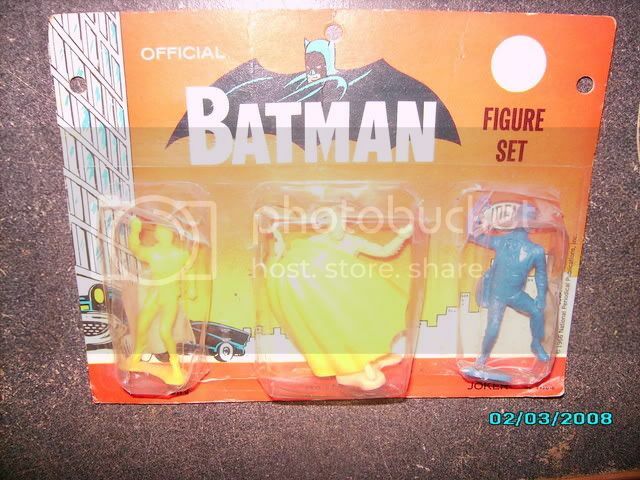 This is a 1960s Batman 3 pack Sealed. I bought a nice thing bank. The first time it was out of the box ever, was just a few minutes ago. Notice the two variations. I bought the one with the logo a while back. It has a lighter box. The bright darker box, with the bank with no logo is the one I just bought. 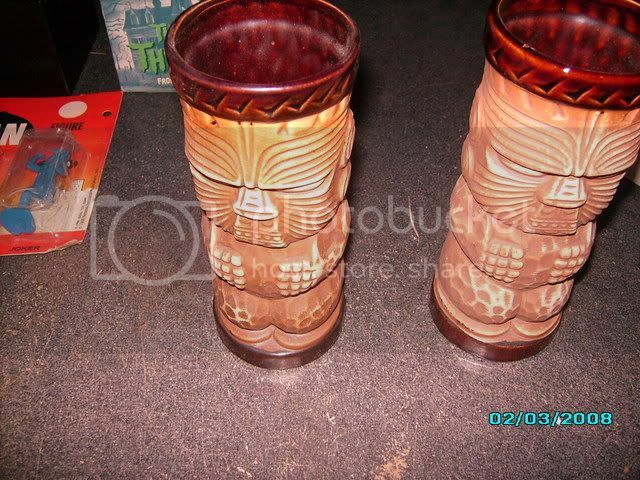 I got a few pulps, but they are at the shop and these two tiki Mugs at the Long beach Flea market. This was my favorite purchase of the show. 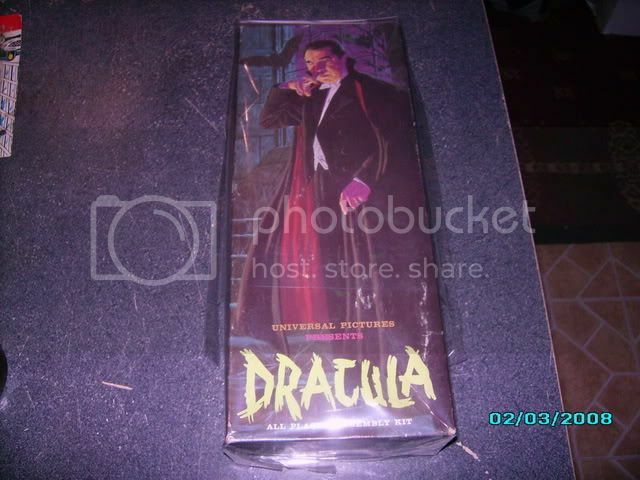 A mint long box DraculaUnbuilt Cherrrryyyy. Ah so you ended up with that Kong. I saw it on e-bay but after the auction ended. At least it went to a good home. But still..... I NEED THAT KONG !!! Good finds HH, love the Thing bank with the logo. Mine's blank. I was wonderin' where you'd been of late. 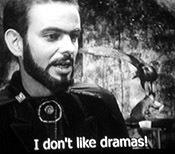 Yep, My posts might be few and far between, Tell the middle of March. I still read a lot but just not to active. Got this creech a while back and I don't know a consarned thing about it--anyone have any info? It has a Made in China sticker on the bottom, and hand-written in marker says it's so-many out of 1000. Huh? Very heavy resin. I'm supposing it's an unlicensed, unattributed piece... Any info would be welcomed. It looks like it used the Horizon vinyl kit as the basis of its sculpt. Yep, total bootleg using the horizon kit, some one in Oregon or California had them made in Mexico I believe and had the china sticker put on as a dodge. I still know the guy I bought mine from (in 95? ), which is also where I heard the story, so I'll ask him next time I see him. The GIANT KONG! Great score Dave. As Jason and Shawn wrote, that thing is very elusive. I can't believe you just stumbled on it. Cool addition to your collection. I never saw one at retail either, and with no Imperial markings on it, I've gotta wonder if the produced it. Anyone else ever seen it? I saw the big Kong in stores. I think it was KB and/or TRU. But I rarely see it on ebay. Even more elusive is the Imperial Rodan. There is no question that they produced it. I clearly remember them at KB in an Imperial counter display box that also contained Kong and Godzilla. It was like a "giant monsters" assortment. This was circa 1993 or so. I should have bought one, but at the time Imperial vinyl toys didn't excite me. That stuff was everywhere and seemed like it would be clogging the store shelves forever. It seems like KB had the Rodan for a few months, then they were gone. I've never seen one since.